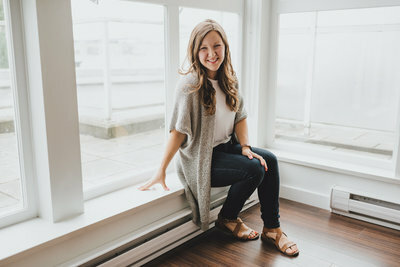 While attending UBC, Kelsey coached hockey power-skating and learn-to-skate lessons. At the end of every school year, in the summer they would host a two week hockey camp and bring in coaches from other schools to help. One of those coaches was Nick. Kelsey and Nick were introduced to each other and got along, but never thought anything more of the meeting. Every once and a while over the next couple of years, Kelsey and Nick would run into each other through a group of mutual friends. They had each one another added as friends on Facebook and one day, the pair started catching up via private message. Around this same time, Kelsey was working at a bank and was transferred to UBC for the week, to help new students during orientation with their accounts. Kelsey was working at her desk one day when she heard a knock on the six-inch window in her office. It was Nick. Nick, who was in the middle of articling for his Chartered Accountant degree, was also transferred to UBC for the exact same week, for a project. The “run-in” felt like more than simply coincidence and the pair exchanged phone numbers, finally promising to catch up in person soon. One week later, Kelsey and a friend decided to join a gym in the city. As they walked up to sign the paperwork for their brand new memberships… Nick walked in. I loved Kelsey + Nick’s outfits and easy-going style in front of the camera. Kelsey and Nick currently live in Calgary, but are West Coast kids at heart. They love everything to do with the ocean and for Nick specifically, fishing and being outdoors! He was glad we could capture these sweet salmon carvings. I love the colours, too! A quick change and we got in the last little bit of fall leaves before venturing onto the docks. We found it! The Algoma. It’s a beautiful boat and we had the place to ourselves… it was so special to have some portraits in front of the boat, especially since the passing of Nick’s father in the past year. I’m so glad we found it. A few quick photos in front of an iconic Vancouver bridge to finish off Kelsey and Nick’s Granville Island engagement session!